This is one of the most important posts I've made yet. It's long, but if you are a teacher in the Church, you need to understand this. First, my normal disclaimer. I admire and respect everyone who serves others in any capacity. Our LDS scholars and educators have done a remarkable job to bring to light many important aspects of the Gospel. They help educate and motivate members of the Church throughout the world, building testimonies and faith and good works. None of what I write is intended to be disrespectful or personal. And yet, IMO, some teachings that are being promulgated undermine faith and testimony. I fully agree with President Joseph Fielding Smith when he warned that these teachings cause members of the Church to become confused and disturbed in their faith in the Book of Mormon. I use this blog to document my own thoughts on the topic. I welcome input and correction of any factual or logical errors that appear here. For years, FairMormon has tried to persuade members of the Church that Church leaders have no idea about the location of Cumorah and that they have left it up to the scholars to figure out. They cite an obscure 1966 comment by then-Elder Harold B. Lee to support their position. Today I'm looking at the quotation in context. It's in blue below. You won't believe how ironic this is. To frame the issue, we need to first look at another part of Elder Lee's 1966 talk. It is the essence of the responsibility we all have as teachers in the Church. If you're teaching the Mesoamerican/two-Cumorahs theory, consider this very, very carefully in the context of the rest of his talk, which we'll look at below. Although this blog often discusses issues of Book of Mormon geography and historicity, the main point of the blog is loyalty, which happens to be the title of Elder Lee's 1966 talk. In my view, the question of Cumorah is a question of whether we are loyal to the prophets and apostles, starting with Joseph Smith and Oliver Cowdery. Can you think of a more poisonous thought than the teaching that Joseph Smith and Oliver Cowdery were "mistaken" about Cumorah being in New York? More precisely, this poisonous thought portrays them as ignorant speculators who misled the Church about Cumorah. Yet that is what professors at BYU are currently teaching. 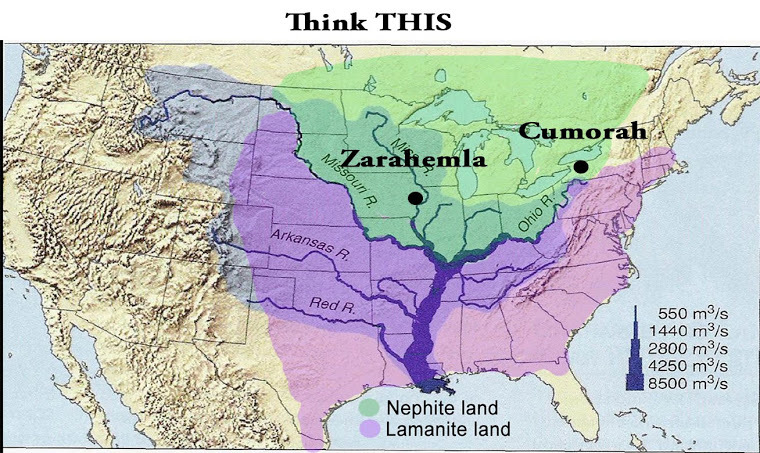 This poisonous thought is the foundation beneath the Mesoamerican/two-Cumorahs theory, because if Joseph and Oliver told the truth, then there is one Hill Cumorah (Mormon 6:6) and it is in New York--which means the Mesoamerican/two-Cumorahs theory is false. That's why anyone who still teaches the Mesoamerican/two-Cumorahs theory (or BYU's fantasy map that is Mesoamerica in thin disguise) needs to seriously ponder whether you are going to continue. I'm focusing on FairMormon because while they do a tremendous amount of good in addressing important issues, they are also a repository for and advocate of the teachings about the Mesoamerican/two-Cumorahs theory. FairMormon wants you to think that Church leaders, beginning with Joseph Smith, have no idea where the hill Cumorah is. "Some say the Hill Cumorah was in southern Mexico (and someone pushed it down still farther) and not in western New York. Well, if the Lord wanted us to know where it was, or where Zarahemla was, he’d have given us latitude and longitude, don’t you think? And why bother our heads trying to discover with archaeological certainty the geographical locations of the cities of the Book of Mormon like Zarahemla?" Harold B. Lee, “Loyalty,” address to religious educators, 8 July 1966; in Charge to Religious Educators, 2nd ed. (Salt Lake City: Church Educational System and the Church of Jesus Christ of Latter-day Saints, 1982), 65; cited in Dennis B. Horne (ed. ), Determining Doctrine: A Reference Guide for Evaluation Doctrinal Truth (Roy, Utah: Eborn Books, 2005), 172-173. Here's the link to the FairMormon site. Now, let's look at the context. The talk is titled "Loyalty." President Lee (then Elder Lee of the Quorum of the Twelve) was speaking to Seminary and Institute personnel at BYU on July 8, 1966. The whole talk is too long to put here, but it's important to understand the context of the quotation so here's the section that includes the quotation. It's still a long passage, but if you want to understand how FairMormon is misleading its readers, you need to read the whole thing. All the bold parts are my emphasis added. Underlinings are in the original. This is taken from the source cited above and the typewritten 1966 version, obtained from the Church History Library, which is apparently a transcript of the talk as given instead of prepared remarks. Now you as teachers are not being sent out to teach new doctrine. You're to teach the old doctrines, not so plain that they can just understand, but you must teach the doctrines of the Church so plainly that no one can misunderstand. Now I get quite a chance to take a test of you teachers. When I'm available, we take every missionary company, after they've gone through the temple for the first time, to the fifth room [sic] and the assembly room of the temple, and there for an hour or so they're permitted to ask questions. Some of the questions they ask are some of the things that some Seminary or Institute teacher has confused them about. Things like, "Does the Church have possession of the Urim and Thummim?" And I said I don't know. Well, then they'll name a teacher who said the Church did, and I said in answer, "Fortunately he isn't troubled with any information on that subject." And sometimes a teacher talks about what he thinks he knows and no one can refute him because no one knows anything about it--not even himself. And so he has a Roman holiday out of that area. Another one that they frequently ask is: "Is it necessary for one to receive his second endowments to be sealed by the Holy Spirit of Promise?" And I said, "Where did you get that from?" And you know a good many of them are traced back to one teacher. In nearly every class it seems to be a pet subject of his. And I've said, "What he's told you is absolutely false. So, that's something you'll have to unlearn." Well, these are just illustrative. I could go on. I think I could have made my whole talk on this subject. For instance, some say the Manifesto relative to plural marriage was not a revelation. And yet President Wilford Woodruff declared it was, that he wrote as the Lord dictated and told him to write. Now if that isn't a revelation I don't understand. Some say the Hill Cumorah was in Southern Mexico (and someone pushed it down still farther) and not in Western New York. Well, if the Lord wanted us to know where it was or where Zarahemla was, he'd have given us latitude and longitude, don't you think? And why bother our heads trying to discover with archaeological certainty the geographical locations of the cities of the Book of Mormon like Zarahemla. Sometimes we've had men who are somewhat in a little higher level in position than you and somewhat a little lower than the angels. They've listened to a board of education and the board would instruct those that this is what the board wants and these designing men would say, "You pay no attention to that. This is what we're going to do." The men under you will never be loyal to you if they see that you are disloyal to those who preside in authority over you. Now, you can put that down as a certainty. We had a teacher, thank the Lord we don't have him now, but we had one who boasted that if he were teaching a class and suddenly a visitor came, he could turn to the conservative element if this was a conservative visitor or he could turn to the liberal aspect just as quickly. And he was an adroit teacher, and he fooled everybody for a long time. But he wasn't fooling his students, and finally a group of students rose up in holy horror and said, "We can no longer take this." We've seen this thing happening again and again, and that's the most disloyal thing that you can do, to let students see you make your teaching an expediency. You're teaching one day this and one moment this and someone comes in that would criticize, and immediately you shift into low gear or high gear as the case might be. That's disloyal to the principles of the gospel of Jesus Christ. Remember that the very worst enemies that we've had are those that are within the Church. It was a Judas that betrayed the Master. It was a William Marks. It was a Frederick G. Williams and Sidney Ridgon, to some extent, and others who thought about the accusations that resulted in the death of the Prophet Joseph. Today it's the same. The greatest and worst enemies we have in the Church today are those within our ranks whom we haven't caught up with yet. Now I sat in with one of our teachers who was rebelling. He'd written a text to be used in the Institutes and when it was turned down and was not acceptable because it was not correct, he just campaigned and he now has such a rank apostate attitude that he declares that he doesn't believe the Church was organized as Section 20 of the Doctrine and Covenants says it was. He doesn't believe that Joseph Smith had the vision as he testified he had. He thinks the Book of Mormon was written by somebody, but he doesn't know who. He is irritated by things that go on in the temple and the temple endowments and so on. Now all the spleen and the ugliness of his soul comes out when he's not longer sustained as a teacher, but while he was there, how many minds he poisoned. Better that a millstone be tied about your neck and you be drowned in the depths of the ocean than to offend one of our Father's little ones. You're an ideal, you're a trained teacher. And if you're disloyal in your teaching, and if you lead them astray and put poisonous thoughts in their minds, it may be the thing that will keep them from ever attaining the high place in the kingdom. You are dealing as President Berrett has said with more than 130 thousand young students. They have fertile minds, and you have the chance to plant the seed that will develop into faith, into knowledge, into testimony, and into certainty and perhaps keep them clean. With this context, let's consider the FairMormon quotation (the one in blue above). First, it is remarkable that FairMormon resorts to this obscure 1966 statement to repudiate the explicit and consistent teachings of ordained Church leaders from Joseph and Oliver in 1835 through at least Elder Mark E. Peterson, speaking in General Conference in 1978, all of whom have affirmed that Cumorah is in New York. Second, it's unimaginable that Elder Lee intended this isolated comment as a repudiation of these consistent teachings, especially in a talk about Loyalty--and especially in a talk not made available to general Church membership that was never published in the Ensign and never quoted by any other Church leader. If not for FairMormon's effort to justify its Mesoamerican/two-Cumorahs theory, the off-hand comment would have been long forgotten. Third, not only is the statement obscure and isolated, but the nature of the transcript suggests that in this section of his talk Elder Lee was not reading a prepared text, but was extemporaneously giving additional examples of false teachings. That makes the wording a little ambiguous, leaving FairMormon a little room to assert its interpretation that, in fact, Elder Lee was repudiating Joseph, Oliver, and all of their contemporaries and successors. For those three reasons alone, the prudent course would be to recognize the comment as an off-the-record, unprepared extemporaneous expression that doesn't merit in-depth analysis. Yet FairMormon has elevated the comment to a central position on its web page and in its promotion of the Mesoamerican/two-Cumorahs theory. So let's consider the comment in detail. Given the imprecision of language, every reader can decide which interpretation makes the most sense in context. Notice that Elder Lee itemized four false teachings he had to deal with, things that "some Seminary or Institute teacher has confused [students] about:"
1. Does the Church have possession of the Urim and Thummim? 2. Is it necessary for one to receive his second endowments to be sealed by the Holy Spirit of Promise? 3. Some say the Manifesto relative to plural marriage was not a revelation. 4. Some say the Hill Cumorah was in Southern Mexico (and someone pushed it down still farther) and not in Western New York. Notice the "some say" preface to the last two false teachings. He made this clear enough that no one can misunderstand--unless they want to. FairMormon likes to emphasize the next sentence: "Well, if the Lord wanted us to know where it was or where Zarahemla was, he'd have given us latitude and longitude, don't you think?" From this, FairMormon wants us to think the location of Cumorah is unknown and has never been known; i.e., Joseph and Oliver didn't know, so when they said it was a fact that the final battles took place in the mile-wide valley west of the hill Cumorah in New York, they were merely speculating. And they were wrong because the scholars have established criteria for Cumorah that don't fit New York. Which means Joseph and Oliver misled the Church for decades, since Letter VII was republished so many times. But look at the preceding sentence again. Elder Lee identified the teaching that Cumorah is not in New York as the problem. The next sentence, as I read it, says "if Cumorah is not in New York, he would have given us the latitude and longitude." Of course, promoters of the Mesoamerican/two-Cumorahs theory will object and say, no, he was not saying Cumorah was in New York; he was saying he didn't know, and no other leader of the Church does. Only the Mesoamerican scholars know the truth about Cumorah. I disagree. As I read it, Elder Lee's use of the parallel "Some say" phrase shows that he was referring to the idea that Cumorah is not in New York as a false teaching, just as the idea that the Manifesto was not a revelation is a false teaching. But if this point is not plain enough from what Elder Lee said, consider this additional context. On 23 January 1970, President Joseph Fielding Smith named Harold B. Lee as First Counselor in the First Presidency. "Within recent years there has arisen among certain students of the Book of Mormon a theory to the effect that within the period covered by the Book of Mormon, the Nephites and Lamanites were confined almost entirely within the borders of the territory comprising Central America and the southern portion of Mexico-the isthmus of Tehauntepec probably being the "narrow neck" of land spoken of in the Book of Mormon rather than the isthmus of Panama. "This modernistic theory of necessity, in order to be consistent, must place the waters of Ripliancum and the Hill Cumorah some place within the restricted territory of Central America, notwithstanding the teachings of the Church to the contrary for upwards of 100 years. Because of this theory some members of the Church have become confused and greatly disturbed in their faith in the Book of Mormon. It is for this reason that evidence is here presented to show that it is not only possible that these places could be located as the Church has held during the past century, but that in very deed such is the case." Doctrines of Salvation, comp. Bruce R. McConkie, 3:232–243. FairMormon wants you to think that Harold B. Lee was either unfamiliar with President Smith's teaching, or that he disagreed with it--while giving a talk about loyalty. It's true that in 1966, Elder Lee did not quote President Smith's comment about the Mesoamerican/two-Cumorahs theory. But he certainly alluded to it in his list of false teachings. And he included it in a list of "things that some Seminary or Institute teacher has confused them about." President Smith said, "This modernistic theory of necessity, in order to be consistent, must place the waters of Ripliancum and the Hill Cumorah some place within the restricted territory of Central America... Because of this theory some members of the Church have become confused and greatly disturbed in their faith in the Book of Mormon." President Lee said, "Some say the Hill Cumorah was in Southern Mexico (and someone pushed it down still farther) and not in Western New York." If you are a teacher in the Church and you want to believe that President Lee had no idea what President Smith taught about the New York Cumorah--or that President Lee was being disloyal to what President Smith taught--you're free to do so, of course. But I hope you'll think carefully. On July 7, 1972, when Elder Lee became President of the Church, he named Elder Marion G. Romney as his Second Counselor. President Lee died on December 26, 1973. Elder Spencer W. Kimball became President on December 30 and retained President Romney as his Second Counselor. In the October 1975 General Conference, President Romney discussed the Hill Cumorah. He affirmed that the final battles of the Jaredites and Nephites took place right there, in western New York. "In the western part of the state of New York near Palmyra is a prominent hill known as the “hill Cumorah.” (Morm. 6:6.) On July twenty-fifth of this year, as I stood on the crest of that hill admiring with awe the breathtaking panorama which stretched out before me on every hand, my mind reverted to the events which occurred in that vicinity some twenty-five centuries ago—events which brought to an end the great Jaredite nation." As I wrote above, if you are a teacher in the Church and you want to believe that President Romney had no idea what President Lee taught about the New York Cumorah--or that President Romney was being disloyal to what President Lee taught--you're free to do so, of course. FairMormon and other promoters of the Mesoamerican/two-Cumorahs theories want people to believe that not only Joseph and Oliver, but other Church leaders such as President Joseph Fielding Smith and President Marion G. Romney, were merely expressing their opinions and that they were wrong. Because the scholars say so. That is what you are teaching if you continue to teach the Mesoamerican/two-Cumorahs theory. Every member of the Church--every teacher in the Church--needs to decide for himself/herself if you want to parse Elder Lee's comment so as to leave it open for you to embrace the Mesoamerican/two-Cumorahs theory. I think that's pretty difficult to do in the context of the unambiguous teachings of so many Church leaders, including members of the First Presidency speaking in General Conference, but people find a way to rationalize pretty much whatever they want. "Better that a millstone be tied about your neck and you be drowned in the depths of the ocean than to offend one of our Father's little ones. You're an ideal, you're a trained teacher. And if you're disloyal in your teaching, and if you lead them astray and put poisonous thoughts in their minds, it may be the thing that will keep them from ever attaining the high place in the kingdom." Facts, reason, filters and BYU's "abstract map"